Largely untapped markets such as global remittances represent a huge opportunity for Bitcoin, but the digital currency has not yet arrived at its most difficult stage of development, BitInstant founder Charlie Shrem said at this past weekend’s Bitcoin 2013 conference in San Jose. “Global remittance is one thing that Bitcoin can do really well,” Shrem said, giving the example of a nurse working in the US who wants to send most of her pay back to family in the Philippines. Using a money transfer service such as Western Union, the nurse would have to pay a large fee and wait a week for the money to arrive. “That doesn’t make sense,” Shrem said. If more foreign workers adopted Bitcoin, they would be able to safely and instantly send money home to families at low costs, he said. Shrem’s optimism for the potential of Bitcoin, which he refers to as “cash with wings,” is tempered by the difficult fights with regulators he expects lie ahead. At this point, he said, Bitcoin is at the stage where more people have heard of it, but most people dismiss it as something silly. This, Shrem said, is not the scary stage. To survive the fighting stage, Bitcoin companies will have to work hard to comply with regulations, Shrem warned. Shrem continued, “Whether you agree with the regulations or not, you have to follow them.” Or, he added, try to change them. 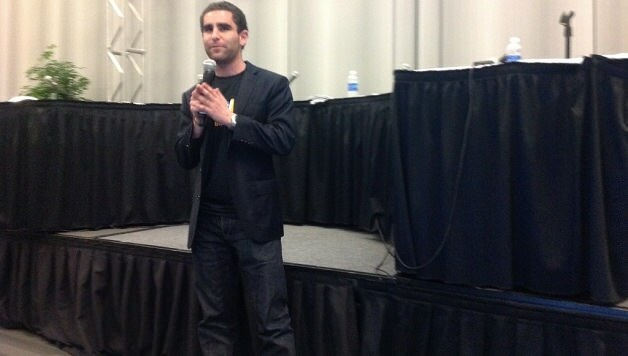 Shrem credited the crowd at Bitcoin 2013 for understanding the true nature of the digital currency better than those who are just now hearing about it. Bitcoin can provide privacy in transactions but is not inherently anonymous, he said. “There’s so much regulation that I feel like it’s pushing down innovation,” Shrem said, adding that — while it’s important to have regulations for the protection of consumers — it would be nice if regulations were standardized so businesspeople like him did not have to get fingerprinted again and again to comply with every state’s requirements.